UMASH prides itself on the efforts and successes of new research, education techniques, and prevention strategies; however, UMASH is not alone in improving the safety and health of the agriculture community. In fact, UMASH is just one of eleven agriculture safety and health organizations that is funded by the National Institute for Occupational Safety and Health (NIOSH) throughout the United States. All organizations continuously pave the future of agriculture with a dedication to bettering knowledge within individual centers and learning from one another. In August 2017, UMASH, the Great Plains Center for Agriculture Health (GPCAH), and the Center States Center for Agriculture Safety and Health (CS-CASH), collaborated at Farm Fest to foster conversations about potential health and safety risks and promote the resources that have come from all three centers. 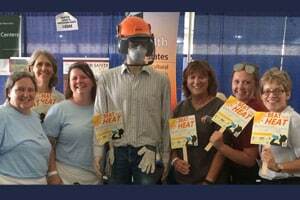 Although each center had a specific focus at Farm Fest, the joint booth broadly advocated for safe practices on the farm. 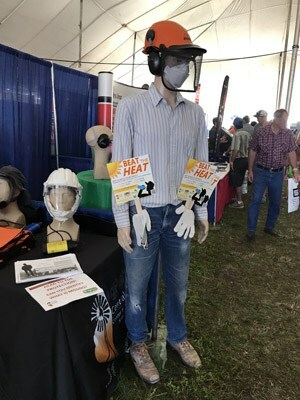 UMASH highlighted the importance of safe equipment and heat prevention, GPCAH shared information on the health effects of whole body vibration, and CS-CASH focused on head-to-toe personal protective equipment suited for working on the farm. Prior to Farm Fest, UMASH created a Farm Safety survey to get a sense of how safety techniques and strategies were implemented on farms. The questions dealt with rollover protection on tractors and combines, guards on augers, and proper protective equipment. The survey also asked who the person most concerned with safety or the “Farm Safety Champion” is on the farm. After each survey, the survey taker received a free UMASH farm safety flashlight. UMASH also advocated for farmers to stay safe during the scorching end-of-summer months. The “Beat the Heat” campaign promotes and educates farmers on hydration and the effects of working too long in the heat. UMASH handed out hand fans with tips and advice on how to beat the heat. Other UMASH resources such as posters, bookmarks, and mugs were given away as well. Representatives from GPCAH demonstrated the adverse effects of whole body vibration with a visual representation and safety tips. The visual display included a graph of the average operation time on a vehicle before reaching unsafe whole body vibration limits. Specifically, a farmer should take a break after riding a tractor for six hours or riding an ATV for four hours. The shaking motion of the vehicle is transferred to the operator through feet, seat, and backrest causing increased blood pressure, muscle cramping, and lower back pain. GPCAH also provided tips and prevention strategy handouts and resources. CS-CASH highlighted the importance of proper protective equipment to use on farms. A six-foot- three mannequin with a respirator, gloves, and hearing protection was used to demonstrate the appropriate apparel for working on farms. Different forms of respirators such as the two strap, the half mask, and the self contained breathing respirator were displayed as well. CS-CASH also handed out branded bags and ear plugs to booth visitors. The collaboration of UMASH, GPCAH, and CS-CASH, is just one example of the cohesive synergy among the NIOSH centers. This partnership is a reminder that each individual organization is invested in the collective mission to improve the safety and health of the agriculture community. Together, the centers move forward to achieve success for the betterment of a culture dependent on agriculture.